Ok. So that one week deadline may have been a bit ambitious. I’m making great progress, but I think this will be a Christmas gift and not a birthday gift. Just to state the obvious, knitting a pair of socks in a week is next to impossible if you’re the mother of a toddler and a baby. Categories: Knit | Tags: blue, handmade, knit, merino, nylon, socks, striped | Permalink. I think it would be next to impossible without kids, too! 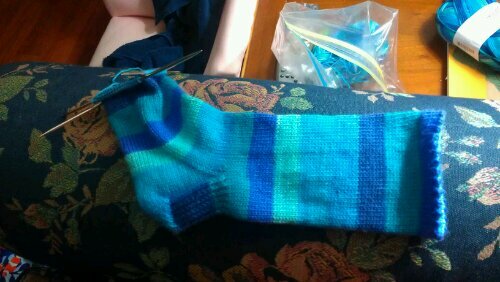 Can you say “carpal tunnel?” : ) Look on the bright side, winter is probably the better time to gift wool socks anyway. The striping of the Felici (right?) yarn looks great. Yes, it’s Felici. That yarn is so soft. Softer than Stroll for some reason. Maybe it’s a finer merino? Speaking of carpal tunnel, I’ve totally been feeling numbness while knitting (which I never did) for a while. I thought it was related to pregnancy, but I’m still getting it now and then. I hope it goes away! Try icing it. There are stretches you can do, too. You can probably find them online. I’m not sure if I could explain it well enough, but if you squeeze your wrist with your other hand while spreading/stretching your fingers out on the bad hand, it can help to open things up and take the pressure off of the nerve. Do the stretch several times, about 10 seconds each.